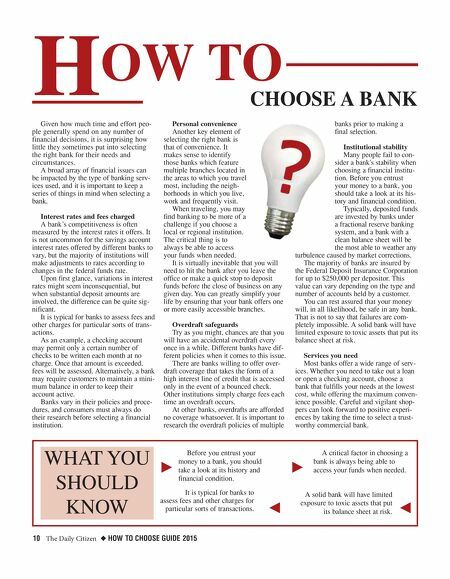 10 The Daily Citizen ◆ HOW TO CHOOSE GUIDE 2015 Given how much time and effort peo- ple generally spend on any number of financial decisions, it is surprising how little they sometimes put into selecting the right bank for their needs and circumstances. A broad array of financial issues can be impacted by the type of banking serv- ices used, and it is important to keep a series of things in mind when selecting a bank. Interest rates and fees charged A bank's competitiveness is often measured by the interest rates it offers. It is not uncommon for the savings account interest rates offered by different banks to vary, but the majority of institutions will make adjustments to rates according to changes in the federal funds rate. Upon first glance, variations in interest rates might seem inconsequential, but when substantial deposit amounts are involved, the difference can be quite sig- nificant. It is typical for banks to assess fees and other charges for particular sorts of trans- actions. As an example, a checking account may permit only a certain number of checks to be written each month at no charge. Once that amount is exceeded, fees will be assessed. Alternatively, a bank may require customers to maintain a mini- mum balance in order to keep their account active. Banks vary in their policies and proce- dures, and consumers must always do their research before selecting a financial institution. Personal convenience Another key element of selecting the right bank is that of convenience. It makes sense to identify those banks which feature multiple branches located in the areas to which you travel most, including the neigh- borhoods in which you live, work and frequently visit. When traveling, you may find banking to be more of a challenge if you choose a local or regional institution. The critical thing is to always be able to access your funds when needed. It is virtually inevitable that you will need to hit the bank after you leave the office or make a quick stop to deposit funds before the close of business on any given day. You can greatly simplify your life by ensuring that your bank offers one or more easily accessible branches. Overdraft safeguards Try as you might, chances are that you will have an accidental overdraft every once in a while. Different banks have dif- ferent policies when it comes to this issue. There are banks willing to offer over- draft coverage that takes the form of a high interest line of credit that is accessed only in the event of a bounced check. Other institutions simply charge fees each time an overdraft occurs. At other banks, overdrafts are afforded no coverage whatsoever. It is important to research the overdraft policies of multiple banks prior to making a final selection. Institutional stability Many people fail to con- sider a bank's stability when choosing a financial institu- tion. Before you entrust your money to a bank, you should take a look at its his- tory and financial condition. Typically, deposited funds are invested by banks under a fractional reserve banking system, and a bank with a clean balance sheet will be the most able to weather any turbulence caused by market corrections. The majority of banks are insured by the Federal Deposit Insurance Corporation for up to $250,000 per depositor. This value can vary depending on the type and number of accounts held by a customer. You can rest assured that your money will, in all likelihood, be safe in any bank. That is not to say that failures are com- pletely impossible. A solid bank will have limited exposure to toxic assets that put its balance sheet at risk. Services you need Most banks offer a wide range of serv- ices. 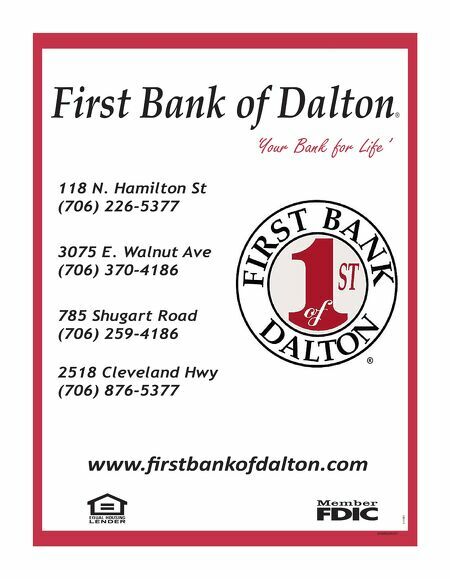 Whether you need to take out a loan or open a checking account, choose a bank that fulfills your needs at the lowest cost, while offering the maximum conven- ience possible. Careful and vigilant shop- pers can look forward to positive experi- ences by taking the time to select a trust- worthy commercial bank. H OW TO CHOOSE A BANK WHAT YOU SHOULD KNOW k j Before you entrust your money to a bank, you should take a look at its history and financial condition. It is typical for banks to assess fees and other charges for particular sorts of transactions. k j A critical factor in choosing a bank is always being able to access your funds when needed. A solid bank will have limited exposure to toxic assets that put its balance sheet at risk.